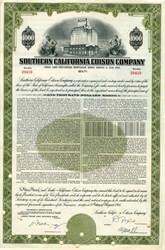 Beautifully engraved $1000 bond certificate from the Southern California Edison Company issued in 1966. This historic document was printed by the American Banknote Company and has an ornate border around it with a vignette of the Edison building flanked by allegorical men. This item has the printed signatures of the Company�s President and Secretary, and is over 48 years old. Punched cancelled. Southern California Edison (or SCE Corp), the largest subsidiary of Edison International (NYSE: EIX), is the primary electricity supply company for much of Southern California, USA. It provides 14 million people with electricity. However, the Los Angeles Department of Water and Power, San Diego Gas & Electric, Imperial Irrigation District, and some smaller municipal utilities serve substantial portions of the southern California territory. The northern part of the state is generally served by the Pacific Gas & Electric Company of San Francisco. Southern California Edison (SCE) still owns all of its electrical transmission facilities and equipment, but the deregulation of California's electricity market forced the company to sell many of its power plants, though some were probably sold by choice. In California, SCE retained only its hydroelectric plants, totaling about 1,200 MW, and its 75% share of the 2,150-MW San Onofre Nuclear Generating Station. The utility lost all of its natural gas-fired plants, which provided most of its electrical generation. The large, aging plants were bought by out-of-state companies such as Mirant and Reliant Energy, which allegedly used them to manipulate the California energy market. However, SCE still owns about half of the 1,580-MW coal-fired Mohave Generating Station in Laughlin, Nevada, which supplied electricity to California, Nevada, and Arizona. Mohave closed in December 2005, amid concerns regarding water rights and coal supplies. Southern California Edison's power grid is linked to PG&E's by the Path 26 wires that generally follow Interstate 5 over Tejon Pass. The interconnection takes place at a massive substation at Buttonwillow. PG&E's and WAPA's Path 15 and Path 66, respectively, from Buttonwillow north eventually connect to BPA's grid in the Pacific Northwest. There are several other interconnections with local and out-of-state utilities, such as Path 46. In addition, SCE operates a regulated gas and water utility. SCE is the sole commercial provider of natural gas and fresh water service to Santa Catalina Island, including the city of Avalon, California. SCE operates the utilities under the names of Catalina Island Gas Company and Catalina Island Water Company.